Well duhh is there any connection between associated or kyosho? let alone a 2wd or a 4wd?. Theres nothing wrong with running it with CF chasis as you make out, take for example the BJ4 or even the new Yoke 4wd, so your point? Yes. They are both offroad RC cars. You want the flex. It will make the car much more predictable and smooth. My point is exactally what I said above. If you want one, fine. Carbonworks does do the chassis like Crim3wav3 said. He is a member of this board. Look a few posts up. 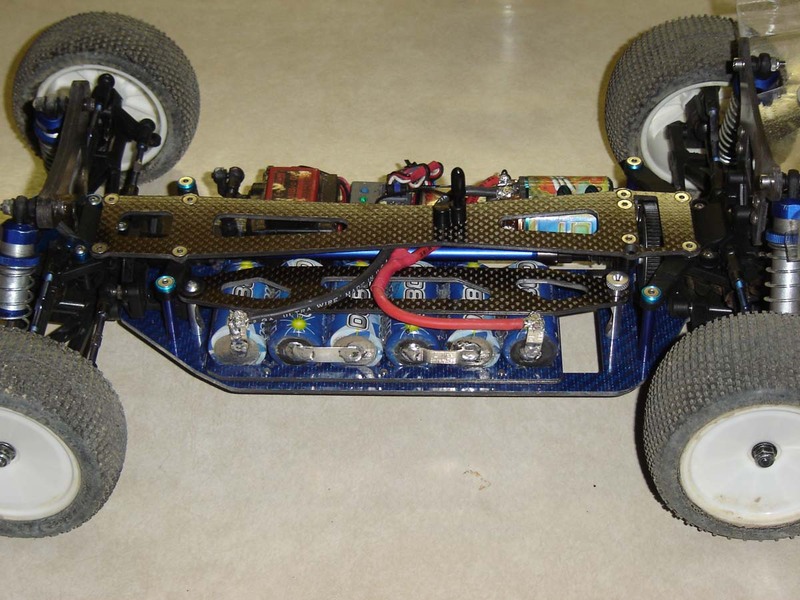 I am not aware of any factory Kyosho drivers using a carbon fiber chassis. Cody King is not and Pavidis isn't either as far as I know. Well, i dont want the flex so live with it . Who does Pavidis drive for then on 10th scale buggies? DirtRacer- We make a carbon fiber chassis set, and we are in the USA. The kit can be ordered in a 2.5 or 3mm main chassis, 2.5mm upper deck, and 3mm shock towers that have been very difficult to break. I havent heard of one breaking yet. The 2.5mm main chassis is a component grade carbon fiber, which is a fair amount more flexible than the 3mm quasi-isotropic. Currently I am testing a 2.5mm component grade chassis with an adjustable battery tray. The tray allows the batteries to move fore and aft about .85 inches. At my home track, I was able to shave 3 tenths off of my best lap, and qualify about five seconds faster than I have ever run on this particular layout. The car was much easier to drive due to the increased steering. I was able to use my on-road style to a better advantage. If you want to discuss more, email me at [email protected]. I'll post some pictures later tonight. Does anyone make an under tray for this car? I don't want to mess up my new bad azz CarbonWorks chassis. Here are the pics of my movable battery tray. I race locally on a very peculiar packed clay surface that does not provide a lot of traction. Its weird Colorado adobe clay. It looks like it would have a ton of traction, but it doesn't. Any way, I wanted to try the batteries in an extremely forward position to see if I could gain some more steering. I drive with an emphasis on corner speed, not on straightaway speed which requires a car that will turn with authority and roll through the corner without using the brakes and sliding. The summary is that I was immediately about 3 tenths faster on my first few laps than I had ever run in the last three weeks. On average the car was much easier to drive at pace than it was earlier-for me. I must admit that I have an unusual offroad driving style- you wont ever see me break traction or slide, so I'm not necessarily advocating this for everyone. Just relating a small breakthrough for myself with this car. Incidentally, this moved enough weight forward on the car to require me to make a taller shock tower to let me lower the ride height enough. I had to adjust the spacers in the shocks too to maintain droop. Has any one else noticed that the rear springs are a bit too long for a rear ride height bones level-even with stock battery placement? By the way, I took the suspension pivot balls from my FT TC4 and put them on the zx-5. No more sloppy arms. The associated balls are english, while the kyosho are metric so they fit very snugly over the hinge pins and very snug into the pivot supports. 10 runs on the car, and no slop-none. The arms are still free to do what they want to do, they just eliminated the excess play on the pins. My friend is going for brushed motor with team checkpoint 10t motor. what esc would you recommend? Would you say this motor is ok for zx-5 DuraTrax IntelliSpeed 8T Pro Racing Forward ESC ? The cells are the same height as always. The slots in the tray for the batteries are wider to allow the batteries to sit lower. Just for the sake of passing on accurate information, you should note that the stock chassis is a "tub" type chassis. Although it is make from a substantially less rigid material than carbon fiber, the shape of the chassis is what makes it stiff. When comparing my 2.5 mm chassis to the stock chassis, the stock chassis is more torsionally stiff. My 3mm is more rigid than stock. 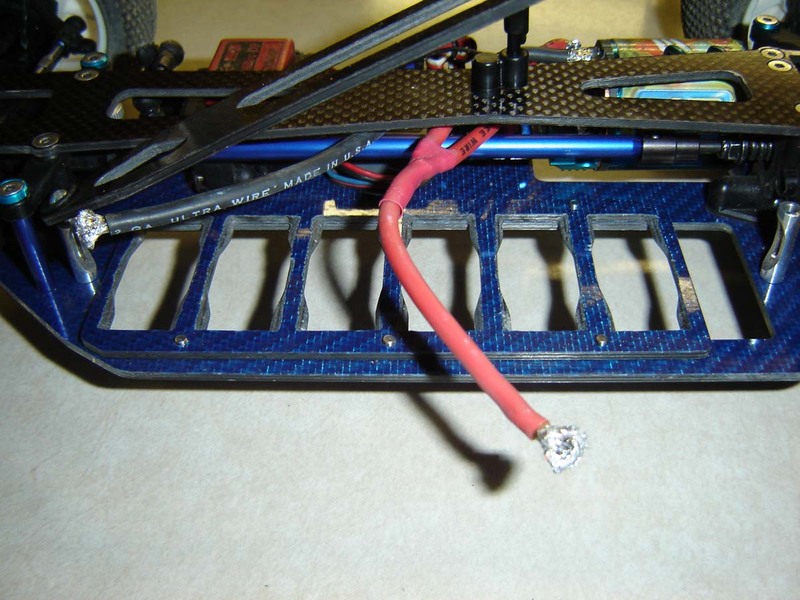 When Mr. Pavidis was talking about his preference for a plastic chassis over a carbon fiber chassis, I'm sure he was referring to the Kyosho molded "tub" style carbon fiber version which would surely be more rigid than a flat sheet carbon fiber chassis. I know that would work, but I would rather have a clear under chassis bod. I have seen them in pics, but don't know of anyone that makes it. ok,i have found that a hobby shop is selling a new zx-5 for 289.00...damn...shall i get it? thats the average price right?